The hero of our story is the high school's valedictorian, but his graduation speech speaking out against sports angers everyone, most importantly Mary Haynes with whom he is in love. She wants nothing more to do with him, so she takes up with his rival, Jeff Brown, an all-around athlete. At Clayton College, the boy is determined to be successful in sports and win back his girl, but his attempts at baseball and field and track events fail miserably. Meanwhile, the bachelor Dean takes pity on him and orders the varsity crew coach to make him coxswain. The boy turns out to be the hero of the race when the scull's rudder breaks off and the boy ties it to his waist, lowers his posterior into the water and guides the boat to the finish line. When the race is over, he can't find Mary. What he doesn't know is that Jeff has been expelled from school and is holding Mary hostage at her dorm so she'll be expelled to for having a man in her room. He gets a frantic phone call for help, and it's up to the boy to save her. However, he has to muster up every athletic skill he can to succeed. Since Buster Keaton's "rediscovery" in the 1950's, his films have been viewed, reviewed, discussed, analyzed, critiqued, scrutinized, interpreted, dissected, inspected and studied ad infinitum - some more than others. One of those films has tended to be overlooked somewhat and dismissed as a minor effort, especially since it was preceded by the work of genius "The General" (1926). That film is "College" (1927). This discussion, however, is not going to analyze or dissect, but, instead, toss around some thoughts about the film from the standpoint of the Buster Keaton fan and the film as entertainment. 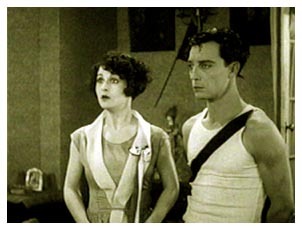 Admittedly, "College" holds a special place in my memory because, back in the days when I was collecting Super 8mm film from Blackhawk Films, it became the very first Buster Keaton full-length feature I had ever seen - and all I know is I loved it. I've watched it over and over again throughout the years, always being well entertained and never bored by the re-viewing - which says a lot for the picture. Variety kicked the movie in the shins, though, with its September 14, 1927, review. "Strong-arm comedy here is only partly effective. Buster Keaton's odd twists of indirect humor never get a chance to function, so determined have the scenario writer and director been to get on a series of gags that would be fool-proof. Instead of leaving the laughs to come from this genuinely funny comedian's pantomime, they seek to make assurance double sure by turning out a slapstick picture on the theory that the mob always falls for stencil humor." Egads! What was this guy (or woman) doing when all of the great gags were taking place? For those who have seen the film, remember the cheap suit getting wet in the pouring rain and shrinking as Buster sat next to the radiator before his high school graduation speech? 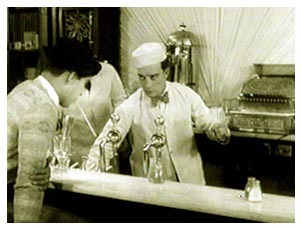 Remember the hilarious sequence where he's a soda jerk and trying to do all the flips, tosses and skillful hand maneuvers of the experienced soda jerk? 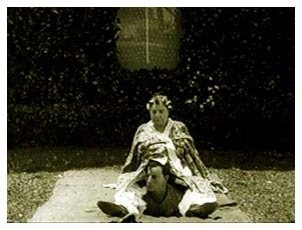 Or the scene in which the guys grab Buster, use a blanket like a fireman's net to toss him into the air and he pulls down a fat lady from a second floor balcony? And what about the dozens of great gags as he tries to participate on the baseball team and in the track and field events? The final scull race could probably be described as more "exciting" than gag-filled, but who couldn't laugh at Buster tying the disconnected rudder to his posterior when it breaks off and then lowering his rear end into the water to steer the boat? Even though the Variety reviewer places blame on the scenario writer and director, Keaton told silent film historian and documentarian Kevin Brownlow, "James Horne (the director) was absolutely useless to me." "I don't know why we had him, because I practically did 'College.'" Of scenarist Carl Harbaugh, he said, "He wasn't a good gag man, he wasn't a good title writer, and he wasn't a good story constructionist . . . But I had to put somebody's name up, and he was on salary with us." The New York Times (September 12, 1927) reviewer was the most brutal (no surprise). "There is such a thing as a character, even in a farce, being so outrageously stupid that he seems more to be sympathized with than laughed at." He goes on to dismiss the shrinking suit sequence as overly long and "hardly worth all the thought and footage put into it." He continues with his criticism by fulminating against the gags in the sports sequences and the final boat race. "Keaton himself strives to be funny, but his actions are so frightfully absurd that it strikes one that the character he plays never ought to be out of an asylum." Ouch! The reviewer does compliment Snitz Edwards as the dean of the college. "The funniest feature of this film is the idea of having Snitz Edwards. . . officiating as the college dean. His antics and grimaces really make one laugh." Wait a minute! Let's go back and look at this film one more time - antics? Edwards is without a doubt one of the best character actors to come out of the silent era, but "College" hardly offers him any opportunity for "antics," and, further yet, very few grimaces. Was Mordaunt Hall (the Times reviewer) by any chance a relative of Edwards? Then there are reviews such as the one from Harrison's Reports (September 17, 1927). "An excellent entertainment! It is, in fact, a better comedy than any of those that Mr. Keaton has produced in the last three years. There are laughs all the way through. . . The scenes in which he is shown playing baseball are a scream . . . The most comical situations are those in which he is shown copying he training of the members of the athletic team that was training for an intercollegiate (track and field) meet. . . These efforts of his cause roars of laughter. But the one situation that will cause the most laughter is that in which he is shown taking part in the boat races." 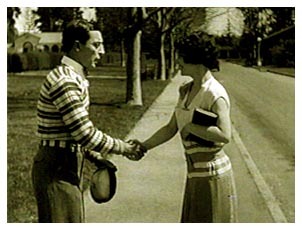 Inevitable comparisons with "The Freshman"
Inevitably, there is the comparison with Harold Lloyd's "The Freshman" (1925) that was made two years earlier. Since tastes vary, let's just say the prevailing opinion is that "The Freshman" is a better movie than "College." OK. For the sake of discussion, we'll accept that. However, what isn't acceptable is claiming that Keaton copied Lloyd when he made "College." The character that each of the comedians play in these two films is inept at athletics, but that's about as far as the comparison goes. These two comedians have totally different styles, and not only does Keaton bring us a different story with "College," he brings us a totally dissimilar set of gags. Historian William K. Everson (American Silent Film, Oxford University Press, 1978) explains it this way. "Keaton's 'College' inevitably trespasses on the territory of Lloyd's 'The Freshman,' but there is no sense of duplication - not least because Lloyd's external optimist produces different motivations and gags than Keaton's permanent pessimist." Respected critic Walter Kerr (The Silent Clowns, Alfred A. Knopf, 1975) took a differing viewpoint. "'College is weak Keaton because - for the most part - it could have been just as well done by Harold Lloyd." Nope, don't think so. Lloyd's character emanates a "brashness" that is difficult to ignore, and his optimism (referenced by Everson) would make it difficult to portray the shy, inept, little guy that Keaton developed as our hero in "College." Biographer Tom Dardis (Keaton, The Man Who Wouldn't Lie Down, Charles Scribner's Sons, 1979) felt is was the weakest of Keaton's features (along with "The Three Ages" - 1923). The audience response wasn't completely positive, either. The film earned only $423,000. Fortunately, it was made very inexpensively and did show a profit. However, we can look at the reaction to the film at that time from both critics and audiences, and there may be a totally different viewpoint of this or any other silent film today. It is, after all, 75 or 80 years later, and we do approach our movie going from a totally different perspective than previous generations. "The General" is a good example. Considered a failure when it was released, it is today regarded as one of the best films to come out of the silent era - good enough to warrant inclusion on the American Film Institute's list of 100 Best Films. I think it's safe to say that "College" can be included in that group of films that serves our entertainment needs better today than it did for audiences in 1927. OK, so maybe we did do a little analyzing of this film since we started this discourse. Let's get back to the entertainment value which is packed so neatly into the film's 66 minutes of running time. Does it have a good story? Well, pretty fair. It does a commendable job of injecting pathos without becoming maudlin. One good example is when Buster tries out for the baseball team. The bases are full with Buster on first. The batter hits a fly ball, and Buster runs around the bases and slides into home as if he's just saved the game. The umpire tells him he's out, and he's forced the two men on the other two bases out. The catcher pushes him and orders him to leave. As he walks away, each player he passes pushes him to show his disgust. But is it funny? Most emphatically! It's filled with gags from the first minute to the 66th minute. Does it sustain the viewer's interest? Without a doubt - 66 minutes isn't long, and this one clips along at a good pace with no slow spots. When writers such as Dardis label "College" as the weakest of all of Keaton's films, it's only fair that we take note of the measuring stick he's using. Look at Keaton's output. Is there a film he made during the silent era that - standing on its own - deserves to be called "weak"? For most comedians, the idea of making a film as good as Keaton's weakest would be an achievement. Make no mistake. "College" is good entertainment and pure fun. I thought so when I first saw it back in 1975, and I still think so today.